First, there is the lushly produced and gorgeous-sounding album for the musical The Last Ship, which marked the Broadway debut of rock musician Sting as a musical composer. The album (from Universal Music Classics) for this show about workers’ struggles in a small shipbuilding town in Northern England boasts a powerhouse performance from leading man Michael Esper, as well as Rachel Tucker, Aaron Lazar, and Jimmy Nail (who eventually left the cast so that Sting himself could perform in the show). It’s a grand mix of sounds from contemporary rock to Celtic airs, and there’s even a Latin-infused tango to be heard. It’s definitely worth a listen. Equally impressive is the new cast recording for Henry Krieger and Bill Russell’s Side Show (Broadway Records), the 1997 musical about conjoined twins Violet and Daisy Hilton that enjoyed a brief run on Broadway late last year. It’s a vibrant album, thanks particularly to the performances of Erin Davie and Emily Padgett in the central roles. Robert Joy adds a terrific creepy factor to the recording, playing the role of Sir, the man who manipulates and exploits them. As for the new Broadway cast recording of On the Town (PS Classics), it is a lavish two-disc set that gloriously brings this giddy revival into your home (or earbuds). What’s making this recording so enjoyable and important is that it contains a lot of material from the Leonard Bernstein, Betty Comden, and Adolph Green score that has generally gone unrecorded. So for instance, you’ll find that the encores for both “I Can Cook Too” and “I Get Carried Away” are on the album. Beyond that, the cast just sounds fantastic, particularly Alysha Umphress (see more on her below) as the cabdriver Hildy, and Tony Yazbeck as one of the sailors who has only 24 hours leave in the Big Apple. 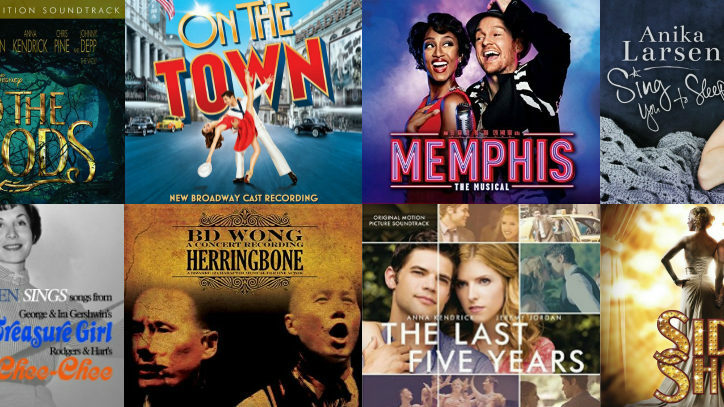 Beyond these three albums that preserve Broadway shows, there are an additional three that capture Off-Broadway productions beautifully, starting with Herringbone (Yellow Sound Label). This one-man musical centers on a child performer who’s possessed by the persona of a murdered vaudevillian. It has an amazing score by Skip Kennon, and this recording features an astonishing performance from B.D. Wong, a Tony winner for M Butterfly who is perhaps best known for his portrayal of Dr. George Huang on Law & Order: SVU. Another Off-Broadway cast recording comes from Yellow Sound, and it’s an entirely different affair. It’s Sara Cooper and Zach Redler’s The Memory Show. This one, about a daughter caring for her mother who’s suffering from Alzheimer’s, has a vibe that brings to mind William Finn’s work. The melodic lines are jagged and the lyrics reflect both the effects of the elder woman’s disease and the neuroses that she and her daughter share. It takes a while to warm to this recording, but it does ultimately prove quite satisfying. At the other end of the spectrum is Jay Records’ buoyant recording of Himself and Nora, a look at the relationship between writer James Joyce and his wife and muse, Nora Barnacle. It’s an Irish delight that stars Matt Bogart and Jessica Burrows in the title roles, and they not only sound fantastic, but they also share a remarkable chemistry that’s comically antagonistic and filled with genuine affection. Just take a listen to “Compatriots in Lust” and you’ll be hooked. A smaller but no less deserving tuner is also a new cast album out of England. It’s the gospel-infused The Last Session, a show about a man suffering from AIDS who’s contemplating suicide. The subject matter may sound unbearably dour, but there’s a lot of whimsy in this show that’s developed quite the cult following since its premiere in 1997. A third British company, SimG Records, which does an amazing job of bringing new musical theater talents’ work to disc, requires a nod for the exceptional concept recording of a new production based on John Milton’s epic poem “Paradise Lost.” For this tuner, which revisits the biblical tale of Adam and Eve and their expulsion from Eden, Lee Ormsby and Jonathan Wakeham have written a show that’s a little bit old-fashioned musical comedy and a little bit 1980s popera. There are numerous joys to be found on the two-disc set. One highlight is the soaring ballad “I’ve Seen His Face,” and overall, this recording generates the same excitement that the original London cast recording of Les Misérables did when it was first released. Musicals reaching the big and small screens have also been plentiful of late. Perhaps the most visible is the soundtrack recording for Stephen Sondheim and James Lapine’s Into the Woods (Walt Disney Records). The two-disc set features not only the songs that folks have come to love since the musical premiered on Broadway in 1987, but many of the instrumental cuts used as underscoring in the film. There are a few rough edges in the vocals, but when the cast shines (Meryl Streep as the Witch is sublime and Anna Kendrick makes a winning Cinderella), it’s a recording that thoroughly delights. 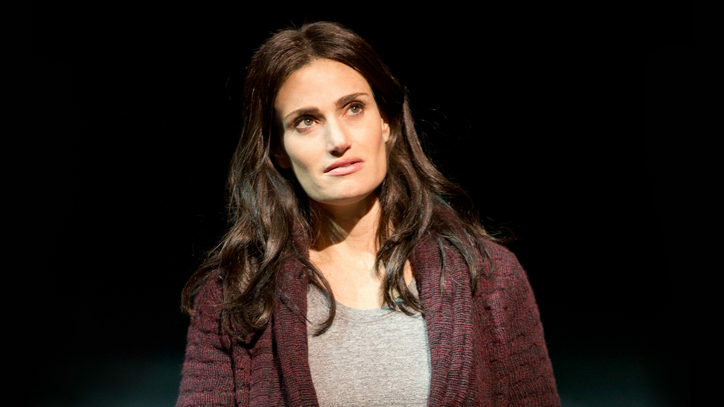 You’ll also find Kendrick, along with Tony Award nominee Jeremy Jordan, on the soundtrack recording for Jason Robert Brown’s two-character musical The Last Five Years (Ghostlight Records). This popular show about a couple’s relationship that’s told from two differing points of view sounds particularly rich on this new recording, and not just because of the two stars. Brown has reorchestrated and arranged his music so that alongside the central eight piece combo, essentially the sound from previous Off-Broadway recordings, there are an additional 13 performers. It’s definitely worth adding to your collection. One more family-friendly album to keep in mind is The Essential Disney Collection (Silva America), which features a host of West End stage talent delivering tunes from such classics as Mary Poppins, The Little Mermaid, and Aladdin. Some highlights include “Let It Go” (from Frozen, obviously) performed with gusto by Louise Dearman (who’s played both Glinda and Elphaba in Wicked in the U.K.), and “The Bare Necessities” from The Jungle Book, which Keith Ferreira of The Singing Accountant sings with jazzy smoothness. There’s a different vibe entirely to I’ve Been Played: Alysha Umphres Swings Jeff Blumenkranz. With this one, you might feel as if the On the Town siren has transported back 50 or 60 years to a smoke-filled jazz club. It’s a marvelously hep recording that displays her knack with a diverse array of material. Some highlights on this one are the smoky torch song “Why Can’t I Kiss You?” a melancholy medley of “Spring Is Here” and “Spring Can Really Hang You Up the Most,” and the jaunty “I Don’t Need Anything But You,” which is also a swell duet with Blumenkranz. Another vocal album with ties to the On the Town revival is Betty Comden Sings (Jay Records). Yes, most people might think of her as the lyricist of this show (and the book writer–lyricist for On the Twentieth Century), but she was also a performer, and with this album, you can get a sense of how perfectly she could phrase almost any song as she delivers 10 Rodgers and Hart tunes from the shows Treasure Girl and Chee-Chee. It’s a joyous listen. Like Comden, Anthony Newley could both deliver a tune and write one, and with Anthony Newley Sings “The Good Old Bad Old Days” (Stage Door Records), you can get a sense of his talents in both regards. This is beguiling set of recordings features the British artist as he delivers 20 songs from a merry (mostly) musical that is a fantastical voyage through time as God decides whether or not the time has come to give it all up and destroy the world. Newley’s collaborator on the show, Leslie Bricusse, even called one of the tunes on here, “The Good Things in Life,” his favorite from his work with the singer-writer. 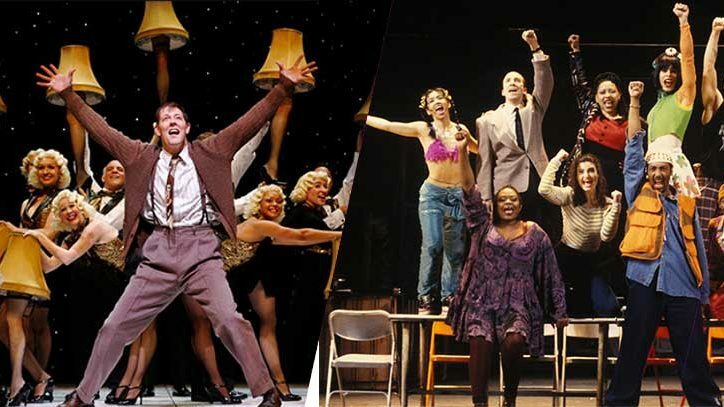 Finally, there are three albums that feature Broadway stars as they assay some pop classics. Hunter (Epic), from Morgan James (Godspell, Motown the Musical), is a sultry pop confection, best epitomized by the album’s sizzling R&B title track. With The Angel Band Project: An Evening with Norbert Leo Butz (Broadway Records), the two-time Tony Award winner (Dirty Rotten Scoundrels, Catch Me If You Can), takes on tunes including “Try a Little Tenderness” and “Proud Mary” along with one show tune, the title song to Lost in the Stars, which he delivers with stirring perfection. And, with Have Faith (Ghostlight Records), Mary Testa (Guys and Dolls, Xanadu) and musician-orchestrator Michael Starobin take on tunes by the likes of Prince, Steven Tyler, and Brian Wilson to create an album that’s as intriguing as it is pleasurable.